Deadman is back! Thanks for posting your adventures, it amazes me to watch the thought process that goes into surviving a challenge like this. I'd be already desperate and thinking how could I've wasted a whole day trying to get a single carcass when the time is ticking on, but then I remember how much guts and hides are crucial to a good deadman run as your previous runs have shown over and over again. I'm learning more about the deadman meta, from the master himself. I wouldn't say it was a day wasted - the weather was so bad that I wouldn't get anywhere anyway, and there was nothing to do indoors. And while Deadman is not for the faint-hearted survivors, I don't think you are one You're right though that the extra guts and hide can make a difference to my future. The plan for today is to search Mystery Lake (the lake, not the whole map!). I hope for a bedroll. I need a hacksaw, too, but I don't think I'll find one here. The howling of the wind tells me I'll have to wait for later in the day. I calmly watch the slow transition as daylight seeps into the windows of the Camp Office. My condition has jumped to 79%, probably an effect of the well-fed buff. I slowly search the building, hoping to find some food I missed yesterday, but there's none. Then I make two quick trips to the lake and back, collecting a few cattails. 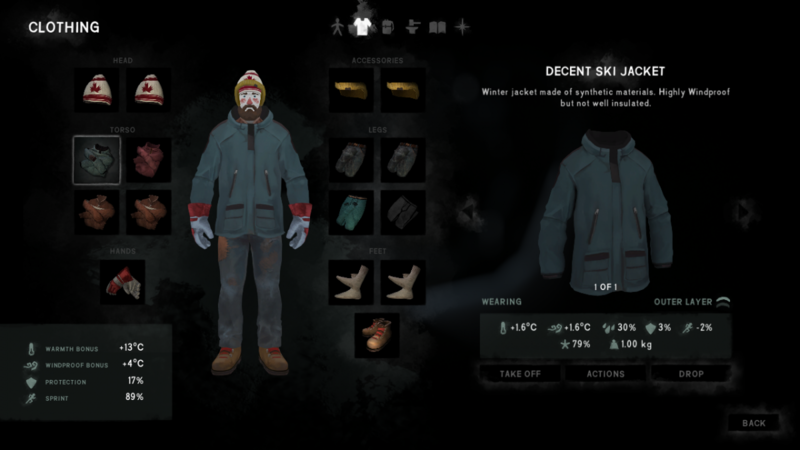 My outfit leaves much to be desired but at least it protects me from frostbite. Around midday, I finally head out onto the lake in earnest, harvesting cattails and keeping one eye always out for the Jacket. However, wolves are gone, only deer are in sight. 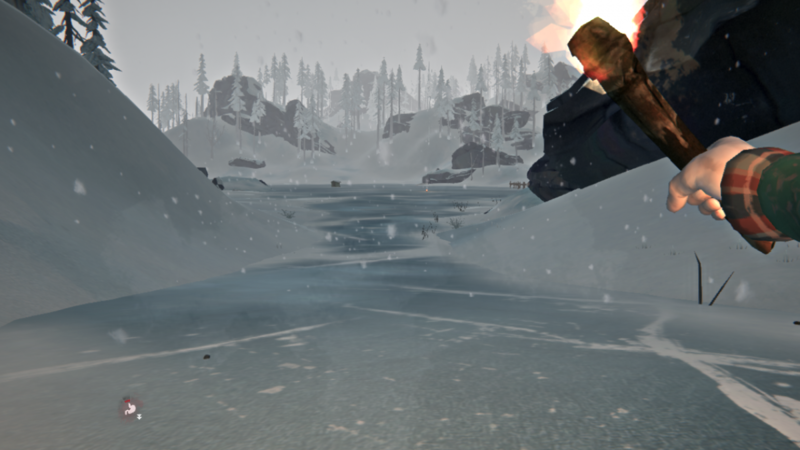 I reach the first fishing hut, then hop to another and start a fire - two failed attempts make me use some kerosene from the jerry can I brought from Will's crash site. I warm up and make water. Heavy snow is falling but the winds are relatively calm, and most importantly, the Jacket has taken a day off. I avoid using any time acceleration out of fear they might spawn. I go around the little island in the center of the lake and get all the cattails I can. The fishing huts yield a can of fish and a chocolate bar. I eat the chocolate right away but leave the fish for later: at 30% condition they could give me food poisoning. Wise, very wise, Mr. Deadman. The air is warm - with a torch I'm at felt +1°C - but the visibility is getting worse as I approach the lake cabins. A while later the winds break out into a blizzard. I hop from cabin to cabin, finding nothing of real use: for a while I consider taking a pair of work boots but it's in such a poor condition that I leave it behind. I sleep for one hour in the last cabin before heading out into the blizzard. It's getting late and I want to start from the Camp Office next morning. 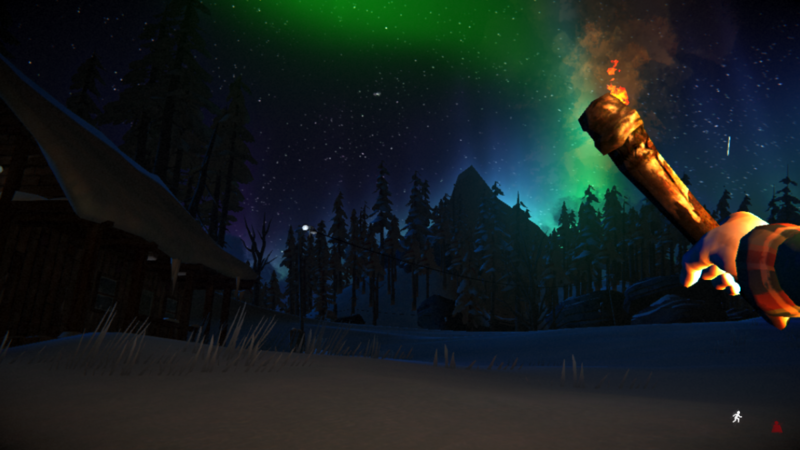 I manage to locate the fishing huts along the way and make a warming fire inside one. I melt some snow - two liters in total - and make use of those water tablets. By the time I'm warmed up, night has fallen. 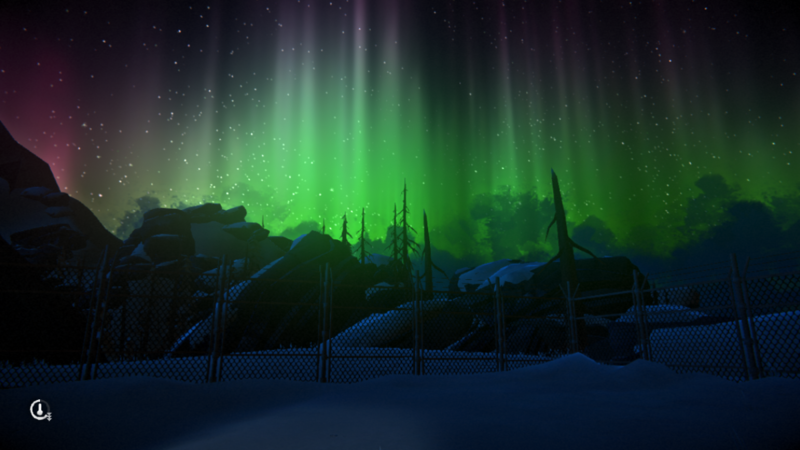 Aurora shows me the way to the Camp Office while I watch out for any glowing green things. Just before bed, I eat the sardines and get my food poisoning. Luckily, I have one prepared dose of reishi mushrooms, so I start a fire in the stove and make my medicine. Condition drops back down to 75% before I go to sleep for 2 x 5 hours. No hacksaw and no bedroll, just poisoned fish... but the cattails will keep me fed for more than a day. Oh, absolutely, neither was I implying it was a wasted day, I apologize if the wording I used gave you that sense. I was just stating that to play deadman effectively you have to maximize the opportunities the weather gives you, and I still find myself on that easy interloper mindset that you can do whatever you want no matter the weather. Your brain has switched to adapt to the deadman meta, mine still hasn't despite a good'ish deadman run. The plan for today is to get to the Dam via Lake Overlook, with an optional (but highly desirable) stop at the hunting blind next to Alan's cave. The morning, however, must be spent indoors. I process torches into sticks, harvest my ragged driving gloves (I found nice pair of work gloves on the lake), read a book and sleep some more. At noon the winds are still and the skies are overcast as I set out uphill to Lake Overlook. 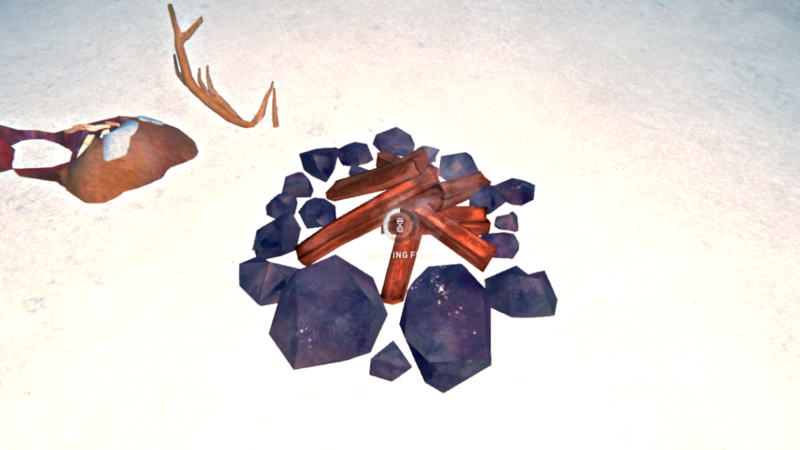 I quickly locate the carcass and build a campfire to let it thaw while making water. To utilize the time, I kill a rabbit, collect sticks and take the rope from the climbing point. The well-fed buff will help me carry this heavy load, intended for the Ravine. Thick fog falls on Mystery Lake as I work on the carcass and cook until mid-afternoon. I only need the meat, but even this is a tedious and lengthy process without tools. Finally, when I'm done with the deer and the rabbit, I make coffee (from a can of Big Moose Kicks I found in Milton) and visit the cave. The guy there was quite a bookworm before death and I can't say I'm thrilled by the find, but what can I do. Then it's time to leave, fog or no fog. At first I lose my bearings when I realize I'm headed to the Derailment and end up back at the cave. At least this helps me get oriented again. On the second try, I safely reach Northern Access with only a sprained wrist. Driving a deer ahead of me, I visit the hunting blind, but there is no bedroll - in fact, there's nothing at all, just two rosehip bushes. I'm tempted to harvest the deer carcass there - the wolf isn't around - but it's getting late again. Instead I return to the river and clear out all cattails up to the Dam, then carefully move to the trailers. No wolves show up today. In the remaining time I search the two trailers and a car but only find a can of soda. Then it's ten hours of sleep through an aurora night. I'm at the Dam and in good shape, but still no bedroll and no hacksaw. The winds blow hard in the morning. I transfer to the Dam and search the upper part (minus the offices upstairs), finding almost nothing. I leave through the emergency exit in the Lower Dam and although the winds are still at full strength, I find the carcass well shielded from them. I start a fire and wait for it to thaw. When it's ready, winds seem to die down a bit. 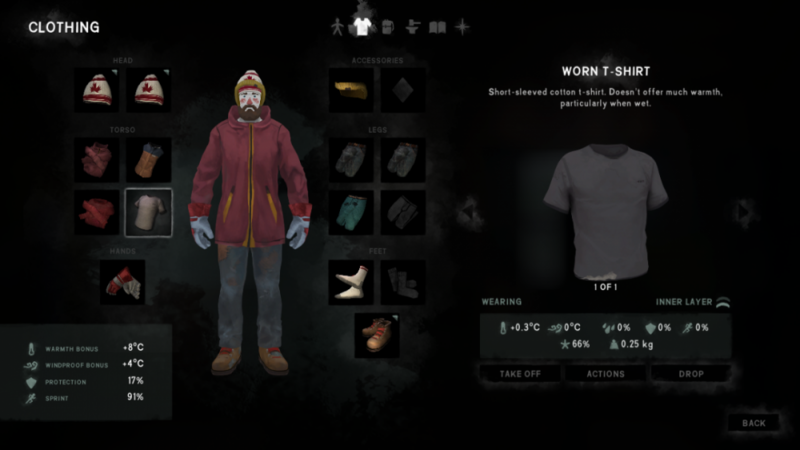 I get 1 kg meat out and cook it, then proceed with the guts - a blizzard breaks out, kills the fire and forces me back to the Dam. As I search the Lower Dam, I find a wool ear wrap in bad condition and finally, hacksaw. Waiting for the blizzard to end, I repair the ear wrap, then return to the carcass and strip it fully: the remaining 0.9 kg meat, hide and guts. 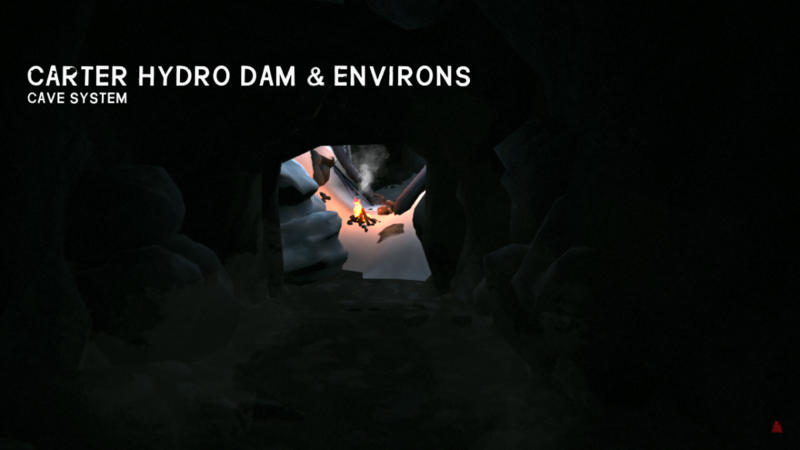 Then I transfer fire through the Dam to the carcass at the upper exit. There I manage to get the meat (1.1 kg) before the winds return and kill the fire again. Hide and guts will have to wait for tomorrow. Harvesting deer carcasses in highly variable weather is a never ending battle against the wind. For today, the plan is to finish off the carcass at the Dam - I'll absolutely need the guts waiting for me when I return through the Dam some two weeks from now - then proceed through Winding River to PV. 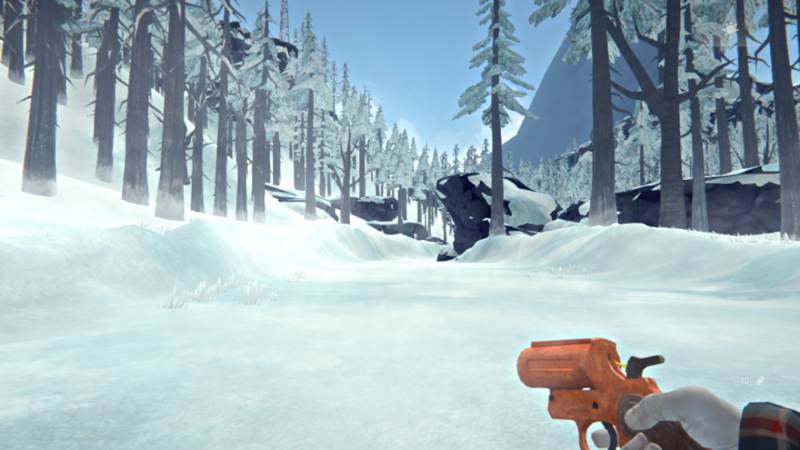 Normally I'd prefer the Ravine with its flare gun, but that would be risky without a bedroll. I'm done with the carcass before noon and pass through the Dam. I pick up a few stacks of papers because I'm running a bit low on tinder. The weather is tolerable on the other side and both wolves are patrolling close to the Dam, which allows me to slip through without incident. 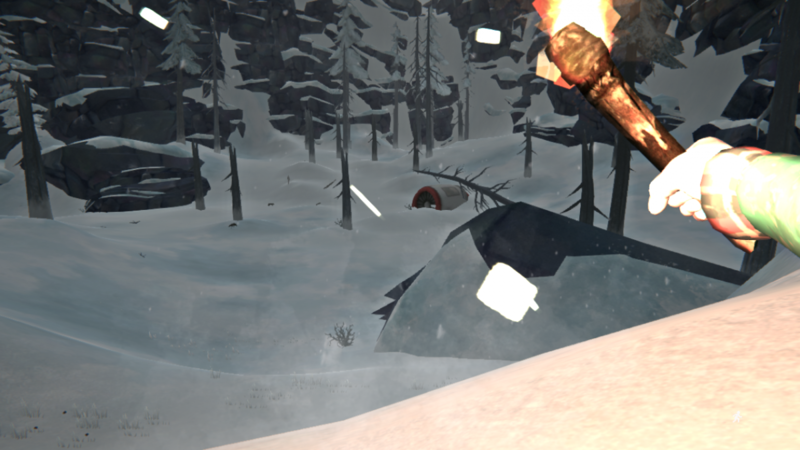 When I reach the small cave with the rabbit run, I find a bedroll (as I hoped) along with matches and dog food. My plans change. Now, instead of carrying on to PV, I'm going to harvest the deer carcasses in Winding River and return to the Dam, so that I can visit the Ravine on the next day. The rest of the day is uneventful, with favorable weather and an equally favorable bugged carcass (in the picture) which hasn't been fixed yet - it's a "double" carcass, two deer in one. I get so much meat that I fill my stomach and keep some to spare, plus three guts and three maple saplings. I carry everything into the Upper Dam and sleep there in my new bedroll. With three deer hides, 12 guts and three maple saplings curing at Trapper's Homestead and in the Dam, I should have a strong start when I return. If I return. I killed the time in the cold morning by searching the upper offices. I found beef jerky - enough to offset the calorie cost of the search - and grabbed a few books for fuel. Later in the day I moved to the Ravine. I found a jerry can, a hammer and a rope in the derailed boxcar - I took the kerosene but left the rest in place, for I brought a rope from ML and already had a hammer at Trapper's. Then I dropped a few cattails in a cave, to have a small stash for my return, and was careful not to touch any of the two carcasses in the area. I knew I'd be hungry next time I'll be passing by. ... early morning of the next day to get full rest. I only had to start fire before daybreak, so I used it to cook the meat and make some water. Around midday it got warm enough for me to climb back up. After a brief rest at the second cave, I crossed the Trestle and into Coastal Highway, eventually reaching Bear Creek Campground at dusk. The carcass was in its usual place. I was tired and night was coming, but food is key for a Deadman, and this carcass had 1.9 kg - one of the fatter ones. 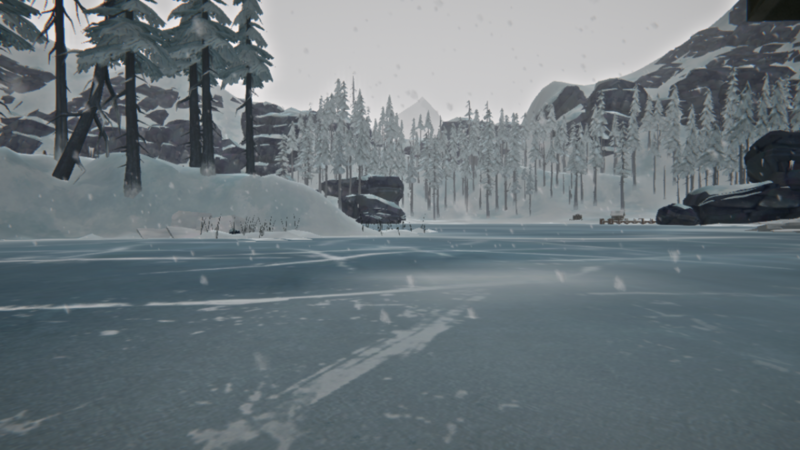 Nevertheless, I started by making water and checking the area for wolves and the bear. Only then did I get down to work, taking 0.5 kg at a time and listening up carefully after each one. Weather was getting worse. 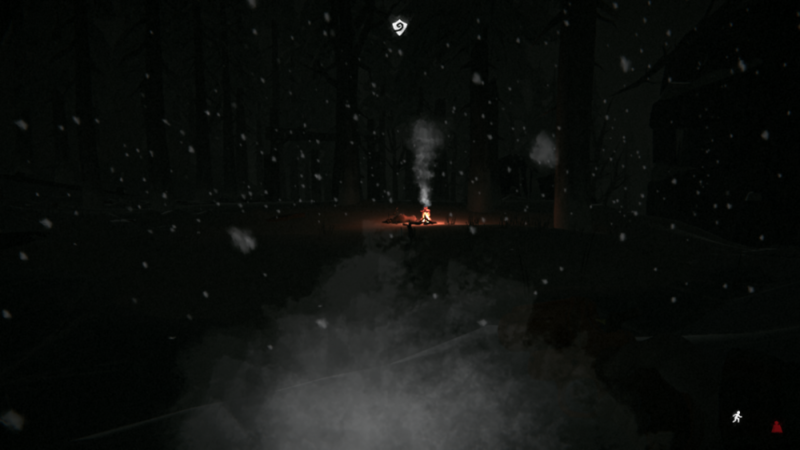 When I was finished with the carcass and about half-done with the cooking, I could hear distant bear sounds, so I took the meat off the fire and retreated to the cabin at Rabbit Grove. Good call: on my way back I could see the silhouette of the bear headed right for the fire. I hope he won't be poking his nose in my dinner. Never heard about that . Or is any carcass supposed to be around 1kg and when I found more it's a bugged one? Can you get 4 guts and 2 pelts? I've found myself in this river map only a couple time on Loper. 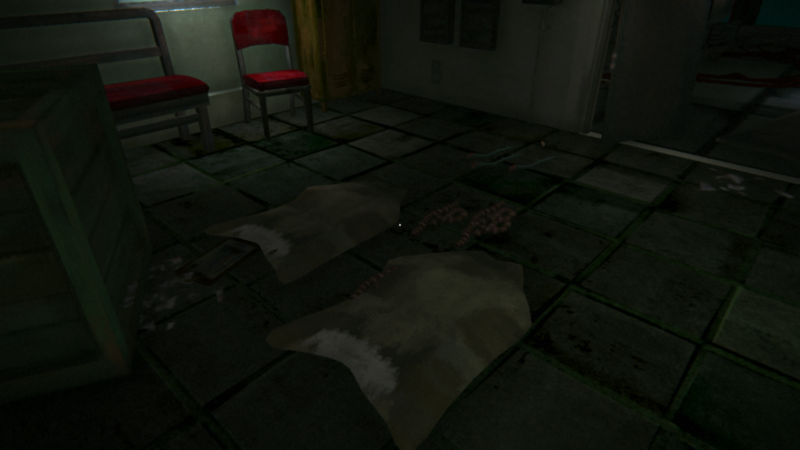 It's two carcasses put in the same place - I don't know if this happens in every game and I don't have a reliable way to access the second "hidden" carcass unless the first one has decayed, but it has happened to me several times there that when I clicked on the first one to get another steak out, I suddenly got a screen with a fresh carcass from "underneath" - with another 1-2 kg meat, another hide and 2 guts. So yes - 2 hides, 4 guts in one place. First thing, I finish yesterday's dinner. The bear is still guarding his campground, so I just pick up the meat and finish the cooking at the cabin. Weather is getting worse and I wonder if I should remain at the fire for a little longer - the poor state of my clothes is starting to tell with the temperatures dropping in the world. But this is Coastal Highway - any weather other than blizzard is good one. I drink a reishi soup and go. It doesn't take me long to reach the Fishing Camp. As usual, the cabin above the Fishing Camp and the cabin next to the workbench are both burnt down. I search the surroundings, finding some food and tools hidden in a boat, as usual. Following a warming break in the bed, I continue to Jackrabbit island. 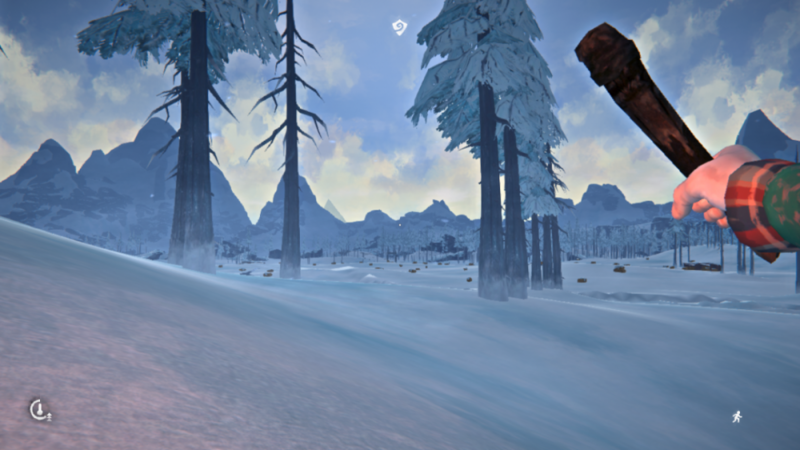 I can see wolves patrolling the western end - my usual approach - so this time I take a small detour and make landing more to the east. 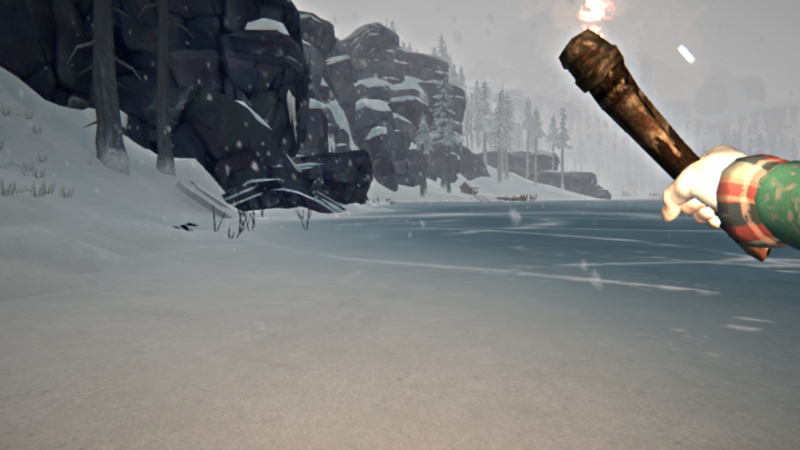 I consider checking out the firestriker corpse on the southern shore but I'm too cold, and I retire to the cabin instead. Canned food is piling up in the backpack - four cans of dog food and a tomato soup. Still no can opener. Before bed I decide to smash a few. Get food poisoning from the last one - 12% dog food. Antibiotics and sleep limit the condition loss to 1%. Waking up in the cabin on Jackrabbit Island, this particular Deadman knows he is behind schedule. The famous 'Number 10' was in the Mountaineer's Hut at this time. He leaves early, because he has a lot of catching up to do. The firestriker guy has no firestriker, or nothing else for that matter. Then the fishing cabin between the two islands, and a warming break. A flare is found lying between the cupboards. It is cold but the winds are mild. 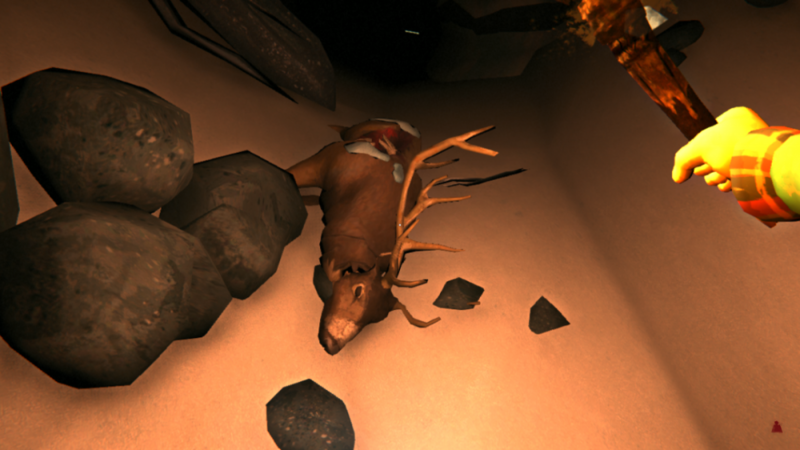 Then on to Log Sort and its two deer carcasses. Empty trailers. Entering the Cinder Hills Mine at dusk: the third stim and a truckload of coal, but not much else. An attempt to repair the hacksaw before bedtime fails, and there goes is only piece of scrap metal. Hmm, hopefully we'll find some more. Deadman 11 spends the night in the mine. Next up - Mystic River (or is it Misty River?) Falls and the prep bunker. If all goes well, we'll be in TWM on Day 13. Morning is too cold, as usual, I spend it in the mine, reading books. When the weather gets a bit better, I head down into Pleasant Valley. There is a wolf at Road's End, so I steer left and onto the river, which allows me to score a few cattails but makes me miss the derelict cabins with the static (?) painkiller guy. The bear cave is unoccupied and I can process the carcass lying next to it, undisturbed. At "Misty Falls Picnic Area", I score one rabbit but the cave does not yield anything useful apart from some fuel. I spend the night at the mouth of the cave. I drop off some items I'm not going to need in TWM and climb the rope. Moose scratch marks around the Landing Gear: got to be careful. I reach the Mountaineer's Hut before nightfall and find another hacksaw on the table. No wolves on Crystal Lake in the morning. The weather is cold but the winds are mild, so I start a warming fire in the middle of the lake and clear all cattails. The bear patrols the other end so I can't pick everything clean, but I still accumulate quite a stash. The afternoon sees me past the Wing (tea, coffee and some pork and beans found in the container) and above Echo Ravine, where I process two carcasses for meat. I end the day at the lower end of the Cave of Engines. As soon as the weather allows, I sneak out to the Engine to steal the clothes in the container - I would normally skip this step on Deadman but who knows what treasures it contains. All goes smoothly until I start a fire next to the container - winds break out in full strength and I barely manage to get away from the wolves and back into the cave without freezing. I'm rewarded for my trouble though: a second thin wool sweater. 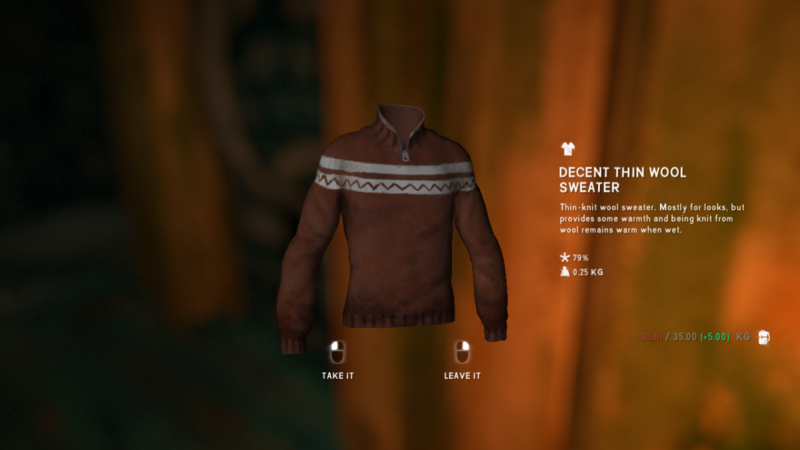 I don't remember the last time I had two thin wool sweaters on low loot settings. After that I pass through the cave and start a fire at the other end. 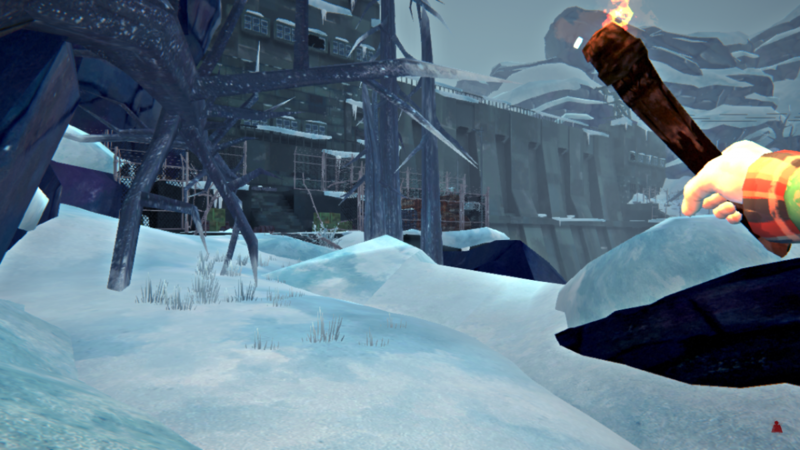 I move the rope from one attachment point to the other - a Snowball-like habit to prepare a shortcut for when I'm coming back from the Summit, but possibly a waste of precious time in Deadman mode. I notice there are no wolves in the area - a rare opportunity, which I capitalize on by clearing out all cattails. I take a small condition hit from freezing on the way back. I reached firestarting skill 3 on this journey, and celebrate by dropping all tinder. Plus I reached cooking skill level 3 as well - the first time I got to this level without finding a can opener. I celebrate that too, by smashing some dog food cans with impunity. I wait again until midday due to strong winds, then swap my mildly worn-out hacksaw (53%) for the second one and move quickly via Wing to Deer Clearing. I leave the container there intact - it probably has only cloth, scrap metal, rabbit pelts and some tomato soup, which will in bad condition by this time. Instead I push on since the weather is favorable, and reach the Secluded Shelf with the help of two cups of coffee. Fully exhausted. Summit tomorrow? Summit Day. 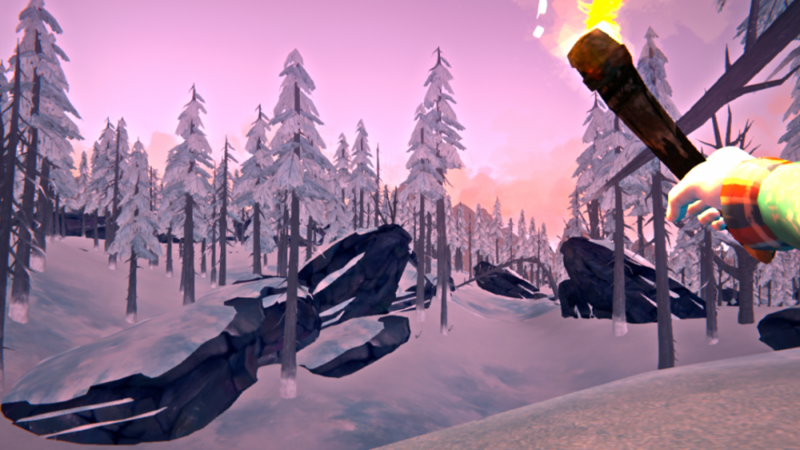 I go to the cave where so many Snowballs built shelters. I build just a campfire and sleep intermittently, waiting for better weather. Once the snowstorm gives way to fog, I'm on my way to the Summit. I'm back before the fire I left at the base camp is out. I opened all containers - sodas are still usable but only two cans of pork and beans could be recovered. The usual supply of salty crackers, coffee and tea. Lots of rags but I keep the ski jacket, wool socks and ear wrap - once repaired, they will help. Two boxes of matches and a firestriker, about half spent. Plus some medical supplies, an one each of wolf, deer and rabbit pelts. Hmm, I was hoping for two deer. I didn't break crates. Morning means repairs. It doesn't take long and my clothing improves to +13C. Then I pick out items I'll leave behind. The well-fed buff helps immensely: I don't have to give up anything really valuable. I still drop books, the rabbit pelt, the extra flare gun and other items I don't need or can find elsewhere. That's because I'll be hauling a rope down the rope. It's wolfy and beary at Eric's Falls, so I make sure not to stay around for long. Bad weather and "ursine attention" catch up with me near Crystal Lake while I'm clearing some remaining cattails, but I escape both without incident and return to Mountaineer's Hut for the night. The weather doesn't let me leave until late afternoon, when the winds finally come to a still. I leave the hut, get immediately barked at and have to get rid of my new companion with an emergency campfire. Then I move fast to the PV bunker and, after a brief stop to pick up supplies, on to Skeeter's Ridge. There I lose way while avoiding wolves and am forced to mountain-goat. Eventually I reach the carcass between the ropes above Draft Dodger's. A blizzard breaks out me while I'm making fire and I realize I'm going to take a hit. I take the quick rope down and run to Draft Dodger's, limiting the loss to 1%. All good but I've been eating cattails all day. I have about 30 left + 4 boxes of crackers, but I should also get some normal food. Crazy winds won't let me get on with my journey today. I pass the day by killing three rabbits: four stones, three hits, the one that missed was because the bunny changed course at the same time I was throwing the projectile. So it's Collecting 'hips and 'shrooms and cooking. I start two fires, only to see them soon reduced to embers by the winds that keep whirling around the cabin. At least manage to finish cooking the rabbits, so I save cattails today. The cost in fuel is massive though. I'm running out of sticks. I wish I had books to read, but I left them all in the cave below the Summit. I wish I inject apply one of my three spare emergency stims to be tired for bed, but darn, my condition is 87%, too high. 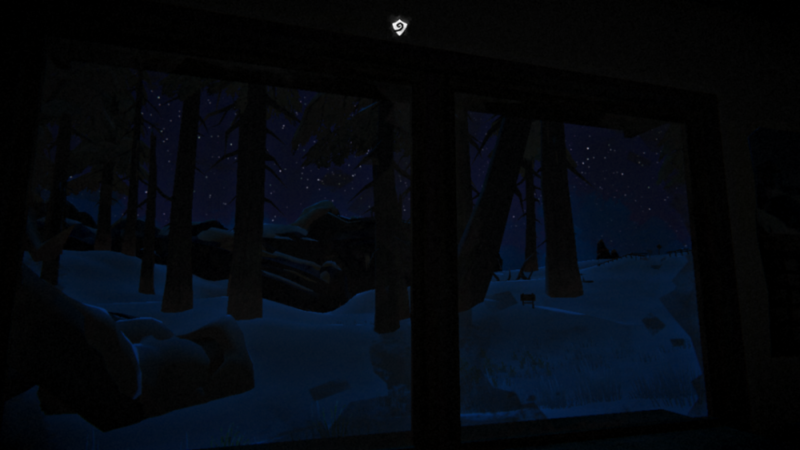 So I just process the mushrooms and rosehips, then stare into a dark corner of the cabin. And find a stale granola bar, which, astonishingly, doesn't attempt to kill me. Oh, the joys of being Deadman. The mornings get colder and colder, but I'm feeling stupid adventurous today. The day has just started, I'm fully rested after a sleepless night and want to do something. Felt -17C should be enough to allow me climb the rope and get the deer carcass I had to abandon two days ago. So I climb and reach the shelf with the carcass just as the winds hit with full strength. 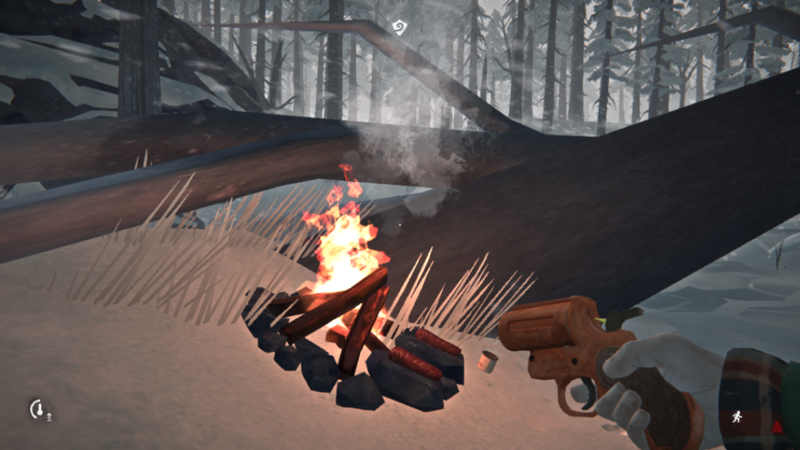 I make an emergency campfire shielded only by a tree and shave off another 1% condition. Mercifully, the winds let my fire live. Just before they die down themselves, they reduce the fire to 9 minutes, so the rest of my scarce fuel supply goes up in smoke. Fortunately I still have coal, so I add in one and use the heat to get all meat from the carcass and cook it. Then I climb back down, roam around to collect sticks - I find enough to feel safe again - and return to the cabin. A few hours of sleep make me rested again while I wait for better weather. In the afternoon I hear no winds outside, so I peek out of the cabin. Minus 7C, good. While I am crossing the river it is already -10C, then -13C... in a few moments the winds make me stop and quickly look for a safe place for a campfire. I sit down, make water and hot tea. The fire warms me up and the winds stop again in the meantime. I head out into the late afternoon and observe it is warm enough to search the barn and tractor away from the Outbuildings. I find nothing of value there and attract the attention of one of the barn wolves. I chase it away with a quick fire and reach the Barn without any more problems. Lots of useful things in the barn. Simple tools in the back of the car - didn't know you could find them there. A mackinaw, also unexpected. Painkillers, emergency stim (my fifth, of which I've only spent one). No food though. I munch on cattails and read a copy of "Stay on Target" before going to sleep. First I repair the mackinaw to 100% and replace my parka - my temperature bonus increases to +16C. Then I read and sleep some more, and eventually leave into the sunny but cold afternoon. 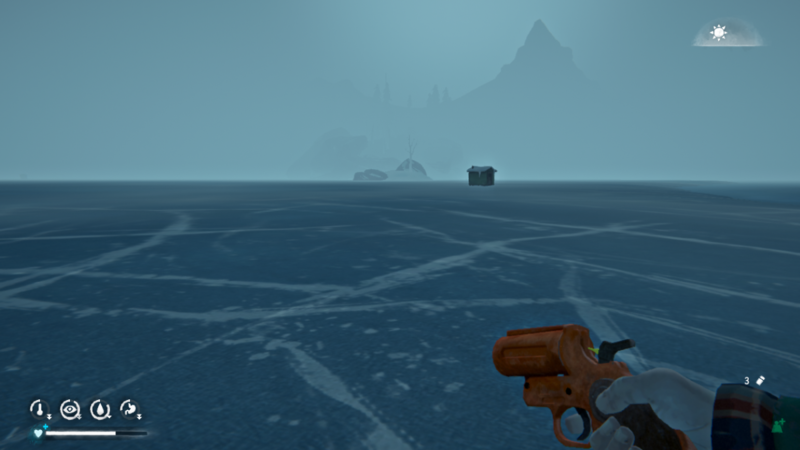 I'm forced to run to reach the Farmstead without freezing and literally jump into the basement. 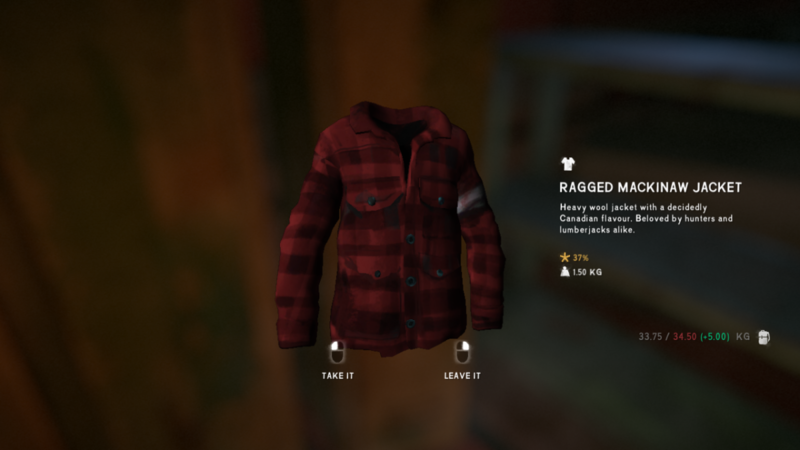 Inside I find quality tools, matches, a third thin wool sweater (I now believe the loot system has received a makeover as well) and a hacksaw in much better condition than the one I've got. The farmstead offers a good amount of food: pork and beans, salty crackers, peaches, two chocolate bars - enough to fill my stomach for today. The usual carcass at the barn is not present though. Things look bright for Deadman 11 - behind schedule but not behind the temperature curve (for now) and on track to reach the Dam on Day 25. Will he find combat pants at Signal Hill? When I get up I tear a few curtains: I want to have some supply of cloth for repairs when I come back to Trapper's. Then I read a few pages of the "Sewing Primer" and optimize my load - even with the well-fed buff I can acquire too many items to carry within the normal 35kg weight limit. The two boxes of simple tools must go, now that I have the quality ones. I finished "Stay on Target" yesterday, so I can drop that, too. This basically does the trick. Felt -19C, brr... I can't reach Signal Hill in this weather, but I can't wait for too long, either. I sleep for an hour and set out. It's foggy. Good news, the bear cave under Signal Hill is unoccupied this time. I make a warming campfire inside and clear reishi mushrooms in the area. Sadly, no carcass here. The conditions would be ideal for harvesting a carcass right now. A while later I go up the rope and feel my way through the fog towards Signal Hill. I frequently stop to listen for threats but hear nothing suspicious. The path is safe. I want to get on with my trek but the visibility is low and I think I hear bear sounds. I return to the safe area of the fence and listen up. No bear, was I imagining things? 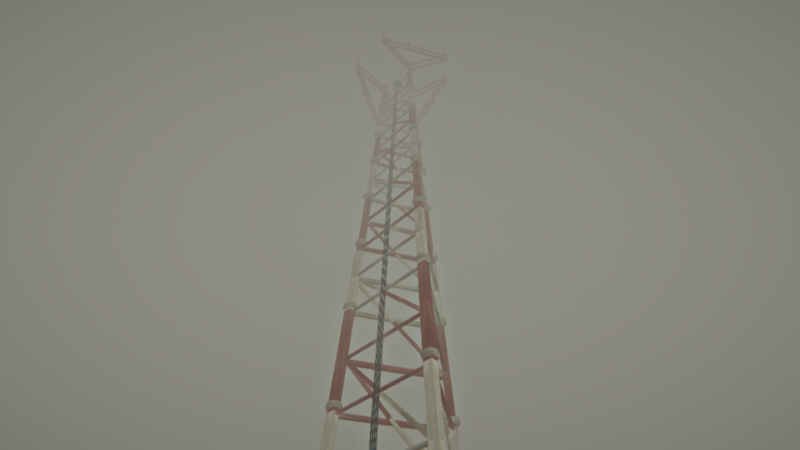 I look up at the tower and decide I should wait for better visibility. One hour of sleep. The fog seems to be thinner. Bear sounds again, this time there's definitely a bear. A minute later I see him strolling outside the fence. It's too late anyway. The moon symbol is up and the sun is almost gone. Darkness and bonus wolves could catch me on the way. I'm staying at Signal Hill tonight. My food reserves are thinning at an alarming rate - around 10 cattails and 4 crackers left - but I prefer having no dinner to becoming someone else's dinner. Aurora tonight. Deadman 11 tunes in and listens to a strange radio transmission. I wake up and repair my bedroll to pass time, then look outside to see more fog - the light kind, the one I like. It's too early and too cold though. I start a fire in the barrell and make some water. The fog retreats and strong winds move in. I end up waiting until early afternoon. Following my usual path to the right of the hill with Hilltop cave, I soon see a wolf blocking my way. I try pass around and run into another wolf. It shows up close and I decide not to take chances - I chase it away with the flare gun. These developments force me to bypass this area completely and take a wide detour towards Hilltop cave. Strong winds return and I have to drop a fire. 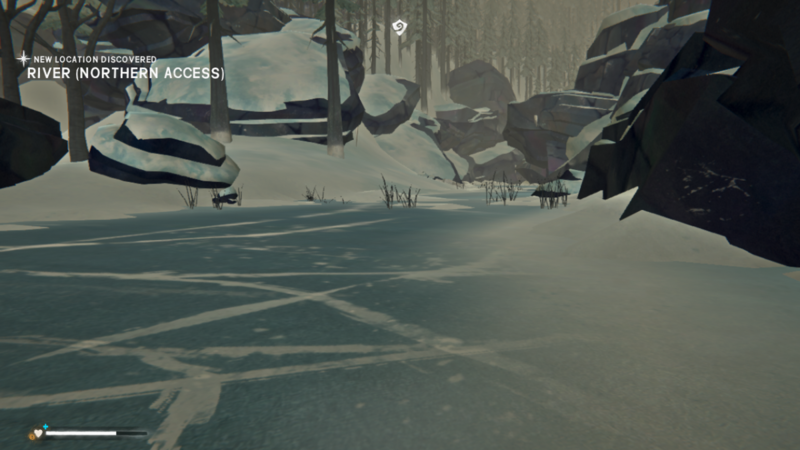 While waiting for my body to warm up and for the coffee to brew, I count 3 wolves in the area I tried to pass through. I also notice a deer carcass at Hilltop, and no suspicious activity there. My next direction is thus decided by the time I'm warmed up and the wind kills my poorly protected fire. The carcass offers 0.8 kg meat. I cook it in the cave and collect large number of mushrooms around. 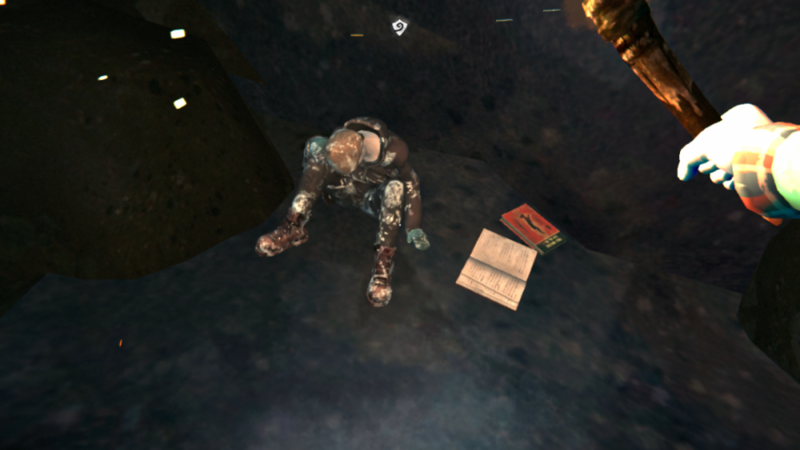 At the hunter's blind I find a corpse with a rusty can of dog food (9%) and a book. Plus there are salty crackers in the cave. Once I'm warmed up and the meat is cook-eaten, I wave Pleasant Valley goodbye. I'll process the carcass tomorrow morning, which will allow me to use fire for cooking the meat and making a warm drink before leaving. Instead I eat the dog food and take chances with the 9% can too - I'm a Deadman after all, and my options are limited when it comes to food. It's my lucky day, I survive the dinner all right. With the deer cook-eaten, I check the weather and return briefly to the fire to make some tea. Then I take advantage of good weather and pass through Winding River to the Dam. Apart from a few cattails, I've already cleared out all resources in this region. I enter the Dam and find my collection of deer hides and guts at the other entrance. It's always good to reunite with one's own stashes of stuff! The weather is still nice, so I move to the Ravine and collect other items I left there - including 10 cattails, very welcome now - and harvest two deer carcasses. I stay up late and spend the night in the Ravine. I revisit the trailer to pick up more supplies and return to the Dam for the big decision-making. I know I'll be overweight but if I take all I've got, my backpack will be at 50 kg. I painfully part with the less useful items and reduce my load to 40 kg. That will have to do. In the afternoon I move to the Logging Camp. I approach carefully the wolf junction at Train Loading and make a wide arc while observing the Logging Camp, but notice no wolf activity. The trailers are utterly empty - source of cloth at best, once I have a knife. I call it a day and sleep in one of the bunk beds. I spend the morning making water at the stove, then set out at around noon. The winds are strong but there is no wildlife: The Clearcut is empty. I only see a wolf in the distance and a deer, also moose scratch marks on trees. 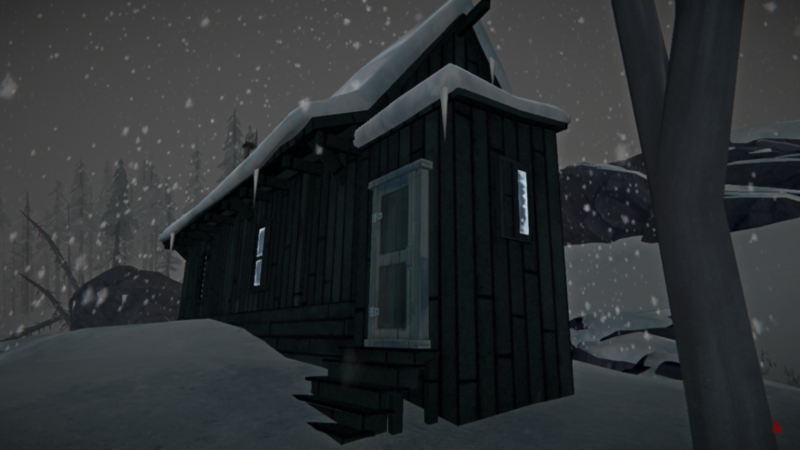 I'm tempted to pay a visit the Destroyed Lookout but the sensible Deadman prevails, and I soon arrive at the cabin at Unnamed Pond. Nothing to be found here, but the bed is warm. In the afternoon I'm off for the last leg of my journey home. From the above I can see there's no wildlife on the Pond. 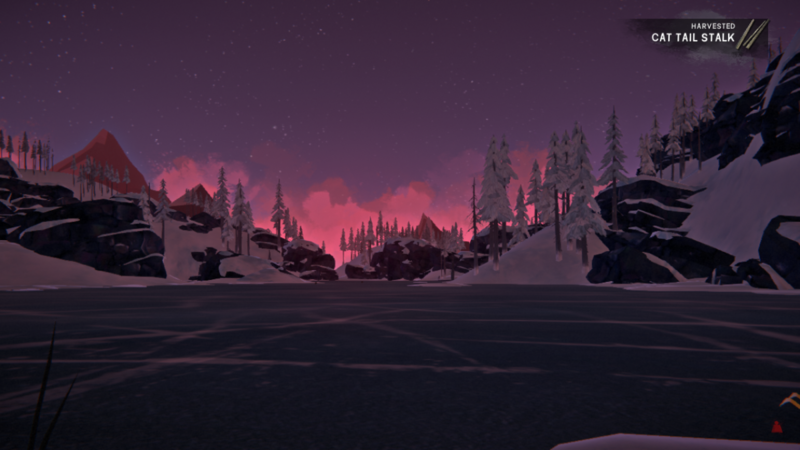 I descend to the frozen pond, collect cattails and cook venison from the deer carcass while warming up. There's an archery book and a flare at the hunting blind. Good. 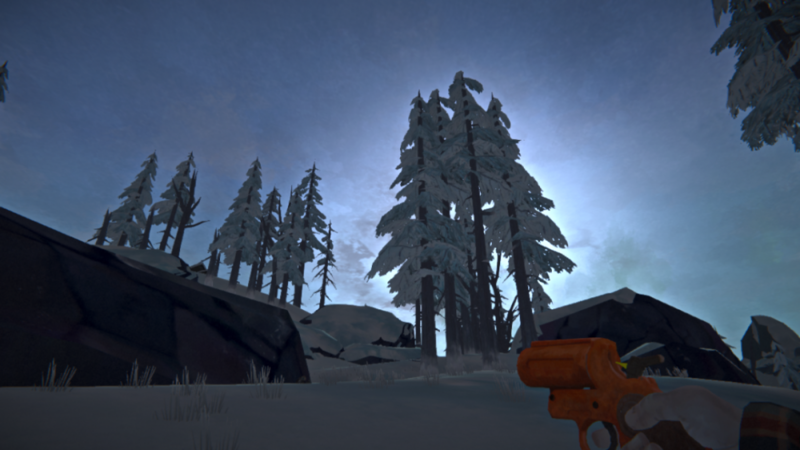 The winds are strong but actually not terribly cold, so dusk sees me home at Trapper's cabin. I quickly craft three snares before it's too dark to work, and place them on the rabbit run. Then I fall asleep, listening to the sounds of a blizzard. This concludes the first part of this Deadman's journey - a wide tour of ML, CH, PV and TWM of Great Bear Island to collect key resources. It was much easier than last time, with fewer wolves and 5 kg extra capacity. Next up: crafting expedition to Forlorn Muskeg. It's always great to come home alive with a heavy load of useful stuff and sort it all. Medical supplies go to the first aid kit: three stims (plus one I keep on me), around 20 prepared reishi and 10 prepared rosehips. I keep all the pills I have - they should be used first, I plan to live long enough for them to expire. 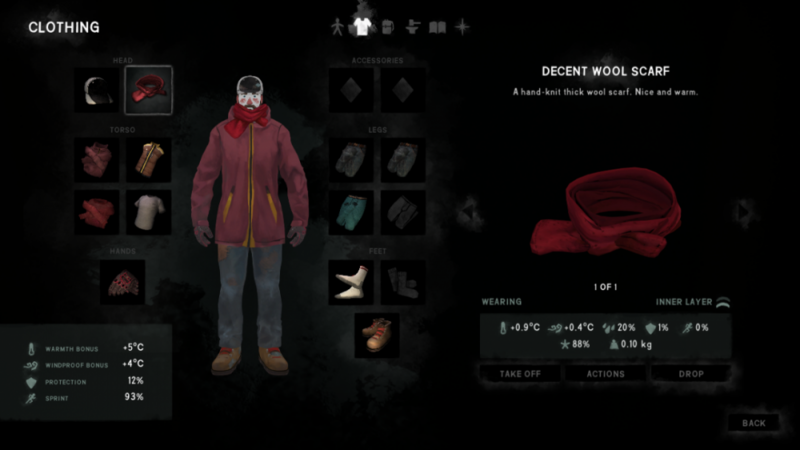 4 deer hides + 1 curing, 5 guts, one wolf pelt (from the Summit) 3 cured maple (+1 curing), 1 cured birch (+ only 2 curing? I thought I had brought more with me - I remember cutting three at... at... Skeeter's Ridge? Where the heck did I leave them again? ), 15 cloth, 2 cured leather, 4 flares (I keep 2), 11 flare shells (I keep 6), 6 whetstones, 7 sewing kits, around 80 matches and 2 firestrikers, quality tools. I also drop some extra coffee in the container under the bed - I'm not opening a coffee shop in FM. 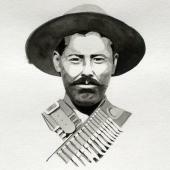 I'm a rich Deadman, the deadest millionaire ever. I sleep for 2 hours, then venture into a blizzard outside and collect 2 caught rabbits. I harvest their meat, then check I've got everything I need on me - especially the hammer and 9 pieces of scrap metal - and notice I'm still carrying 60 crow feathers. I drop them in the locker too, along with all my coal. I'll restock on coal along the way. When I emerge on the Milton side of the cave, I start a fire to make warm tea and to cook the rabbit. When I'm done, it's felt +1C with the torch and tea, but I'm starting to worry about fatigue - I need to climb up to the Picnic Area today and I'm almost half spent. 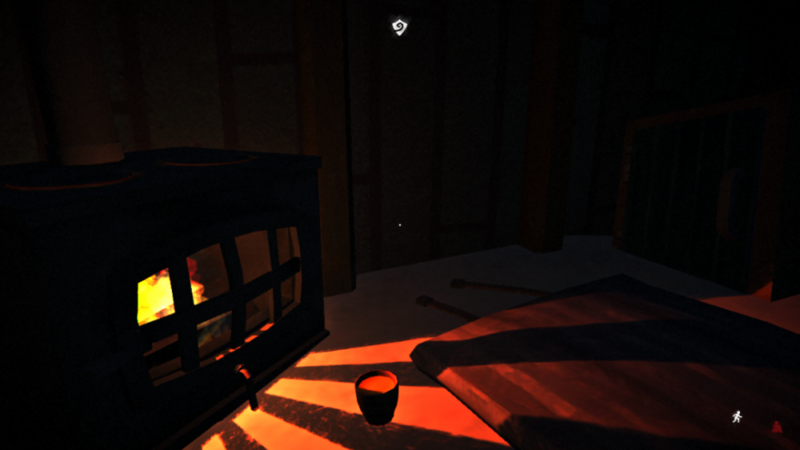 So I sleep for one hour in a cave (6 respawned coals as bonus, but nothing else - I passed through here on Day 1) and make another fire to brew a coffee. I take one last look on the Milton Basin and grab the rope, hoping for the best. Good call with the sleep and coffee. Without them I'd be struggling - this way I just reach the top as my stamina runs out. As the last things before bed, I place my 4 snares at Milton Park and collect sticks. Salty crackers for supper, then I enjoy a quiet night in the office building. Huh. Anew Drifter Deadman running... didn't expect that. Hardly playing myself these days due to work, so it's good to see someone else bearing the torch. Rep earned. Do I recall correctly that the well-fed buff was not part of the original deadman challenge. Has deadman - gasp - become easier? 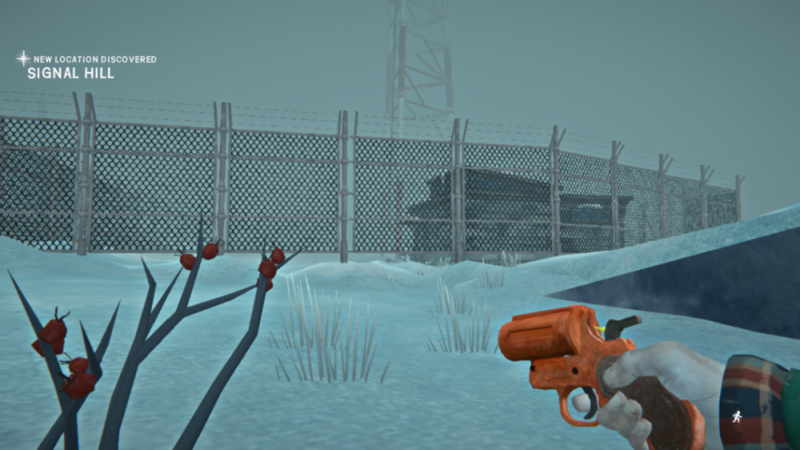 You can't deactivate the well-fed buff as far as I know - if you keep your stomach above zero for 3 days, you get it. The main challenge of Deadman is to prevent any freezing, then to find enough food to avoid starvation. This is still as difficult as before. But once you manage to procure enough food, the well-fed buff helps in two ways. First, it makes the difference between having to choose which potentially critical items to leave behind (especially after Summit, but in general as well) when your limit is 30 kg, and easily balancing your load by dropping some stuff you know you don't need when your limit is 35 kg. Second, unless you travel loaded up to the limit, it takes longer before fatigue makes you feel overburdened with what you carry. So yes, deadman has become easier, as has all TLD play, with the well-fed buff, but not dramatically so. I've also noticed that I'm meeting fewer wolves. It may be just luck or the wildlife was rebalanced too. Not that I mind in this case - I find frequent wolf encounters annoying, one gets used to them and then they lose their power. it's good to see someone else bearing the torch. 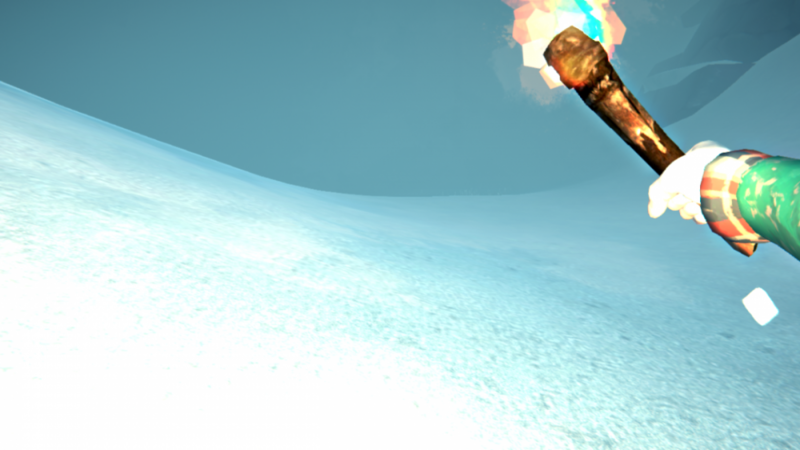 I should add the true torchbearer is @Gooner77, surviving in FM snowball-style by constantly bearing a torch. I had no idea this would be possible. Today's goal is ambitious: Park Office to Marsh Ridge. The reason for the rush is quite vain: both of my previous successful deadmen, Deadman 3 (49 days) and Deadman 10 (115 days) celebrated their 30th birthday at Spence's, and I want to keep the tradition. However, first I need to wait for the warmer part of the day. In the meantime, I cook on a campfire in front of Park Office (perfectly shielded from wind, as I found earlier) - two rabbits that I caught overnight and some water. Then I sleep for an hour or two and set out, with no further delay, towards Milton Basin. I only stop to collect reishi, cattails and to harvest a carcass just above the rope to the Basin. I take the two ropes down, with an one-hour warming/sleep break in the cave in between, and notice moose marks: got to be careful. 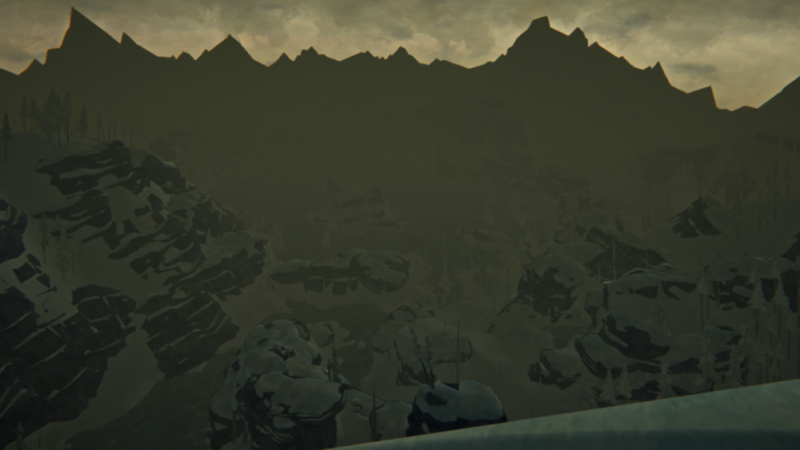 I sweep the area, finding some more cattails and other plants, and end up in the cave at the Basin to warm up again. No wolves are in sight but I do see the moose. 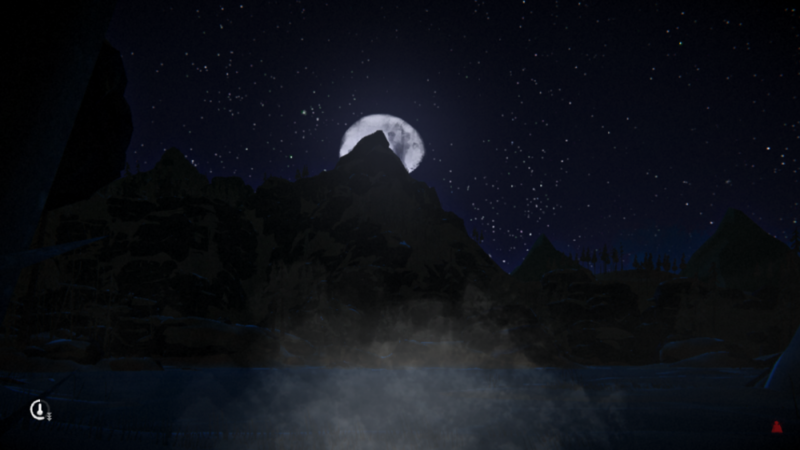 With the moon symbol already rising, I cross the Basin to Hermit's cabin and find where the wolves are: blocking the direct path to the exit, two of them. At this late hour I do not want to risk a detour. And since my firewood situation is excellent, I decide to spend the night at Hermit's cabin. I clear the plentiful gifts of nature, kill two rabbits and sleep until the next day. 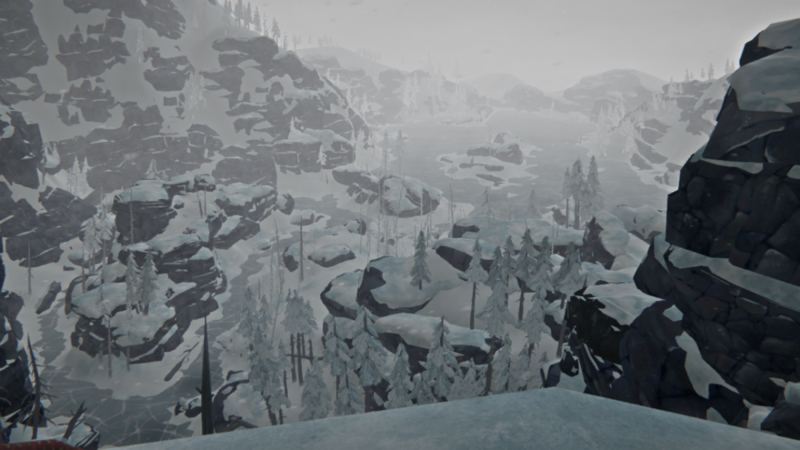 Today I just bypass the wolves and reach Marsh Ridge. No moose there - the place is safe. 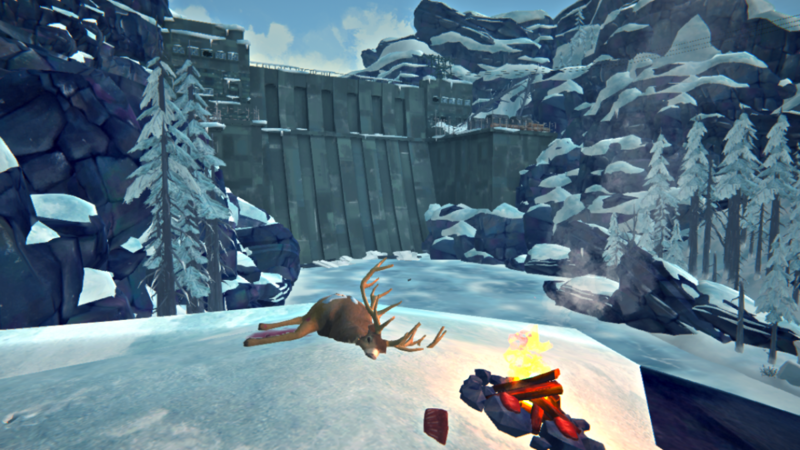 I harvest two deer carcasses (one from the cave, one from the Ridge), find the sixth stim - the last one for a long time from now - and collect more sticks, coal and plants. I deploy the rope at the attachment point for tomorrow's journey to Spence's and spend the night in the cave. The tradition was broken, Deadman 11 is still about 2 days behind his predecessors. I'm glad you made the safe decision! Your deadmans are all about longevity, and this one has a good thing going!